Well, I'm officially sixteen days a doctor. Safe to say I'm still alive and well, maybe a little more sleepy-eyed than my fourth year self. And I would be lying if I said that I didn't have little bouts of gloomy, wistful thoughts during the week. I miss being a quick drive away from my parents. I miss the beautiful, glorious humans that are my medical school friends. Every now and then I'll miss the small city comforts of Indianapolis, the ability to walk through the city without the foot traffic and the ease of getting into a restaurant with a group of friends - these things are so hard to find in Chicago. But simultaneously, I'm loving so much right now, still as grateful as I was when I moved here over a month ago, still as excited about this new life. Going to work is a thousand times more enjoyable than a med school rotation (I've been sitting on the "why" behind this for a while now - perhaps more on that in another post). I will never run out of options for dinner dates with Andrew (we're aiming for once a month, wish us luck!) We only live about ten minutes away from his sister and brother in law, so we're still close to family, which means a lot to me. 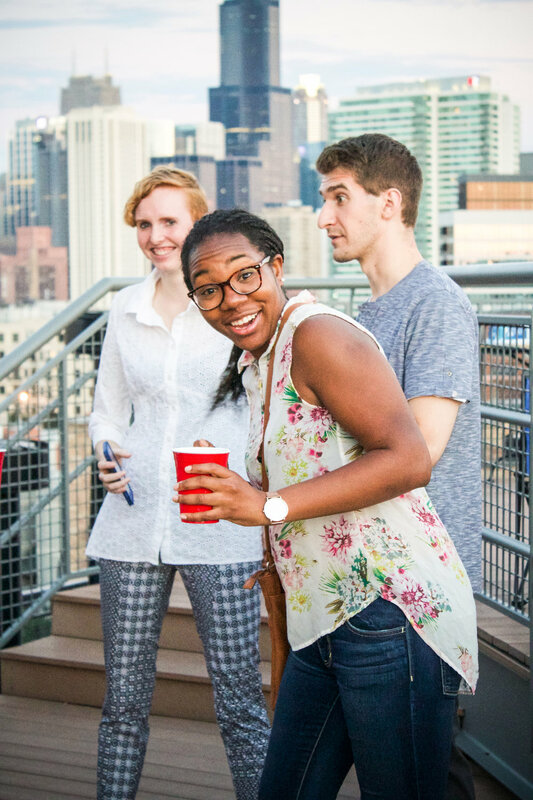 I've met some of the sweetest, smartest, coolest co-residents who share my love of tacos and city views, and I can't wait to spam you guys with pictures of them in posts to come. Like this one! From our barbecue yesterday, to celebrate the end of our first two weeks of being humans who actually earn a paycheck for once, and to enjoy each other's company without the scrubs and stethoscopes. One of the best things about meeting all these wonderful people is that you discover you're neighbors with one of them (hi, Rodriguez! ), and he happens to have one of the coolest views of the city on his roof. And after we made that little discovery, it only made sense to convince him to throw this little shindig (in truth, it didn't take much convicing, because he's a nice guy like that). We kept the food and drink simple - just your basic burgers and hot dogs, no fuss and a general crowd pleaser. I think that's an important thing to remember if you're trying to plan a party - it doesn't have to be all bells and whistles to be successful. It always boils down to just one basic thing: great company and happy bellies. Keep the food simple and delicious, and immerse yourself in the company you've invited over, because it's ultimately your guests - not the decorations or fancy food - that matter. It's something that used to cause me great distress, and it's a concept I wish I had learned earlier in life. It was also a chance to sing the happiest of birthdays to Lauren, one of these said new lovely co-interns, whose snapchats keep me laughing throughout the long afternoons and who texts me sweet encouragement when I had a bad day at work. But mostly she snapchats me the filter with the dancing hot dog. And that is awesome. And with celebrations comes cake. And the birthday girl gets a say-so in the whole matter, so chocolate cake. With almond frosting and toasty coconut and candles to complete the whole celebratory aesthetic. The chocolate cake itself is moist with a deep chocolate flavor - not unexpected given that it's from Sarah Kieffer's cookbook, one of my favorites. The frosting was from the bits and ends of what I could find in my pantry (almond extract and coconut flakes), but ended up being the perfect addition with chocolate. Cake was approved by 10 of 10 doctors present at that party. So I think that's a good thing. Here are photos from yesterday, and the cake recipe is below! Put the bittersweet chocolate in a small bowl. Pour the hot water (or coffee, if using) over it and cover with plastic wrap. In a medium bowl, whisk the buttermilk, canola oil, eggs, and vanilla. In the bowl of a stand mixer, mix the flour, sugar, cocoa powder, baking soda, baking powder, and salt on low (using the paddle attachment) until combined. Add the buttermilk mixture and mix on medium until combined. Whisk the chocolate and hot water together until completely smooth. Add the chocolate mixture to the stand mixer bowl and mix on low-medium until combined. Using a spatula, give the batter a couple of turns to make sure it is fully mixed. Pour the batter evenly into the prepared pans. Bake 25 to 35 minutes, until a wooden skewer or toothpick comes out with the tiniest bit of crumb. Transfer the cakes to a wire rack and let cool for 10-15 minutes, then turn the cakes out onto the rack and let cool completely before frosting. I usually wrap my cakes in plastic wrap and put them in the freezer overnight before frosting - this makes frosting much easier! For the frosting, beat the butter with the paddle attachment until smooth. Add the powdered sugar a little bit at a time, beating until it becomes combined. Add the salt, almond extract, and whole milk and beat until combined and smooth. 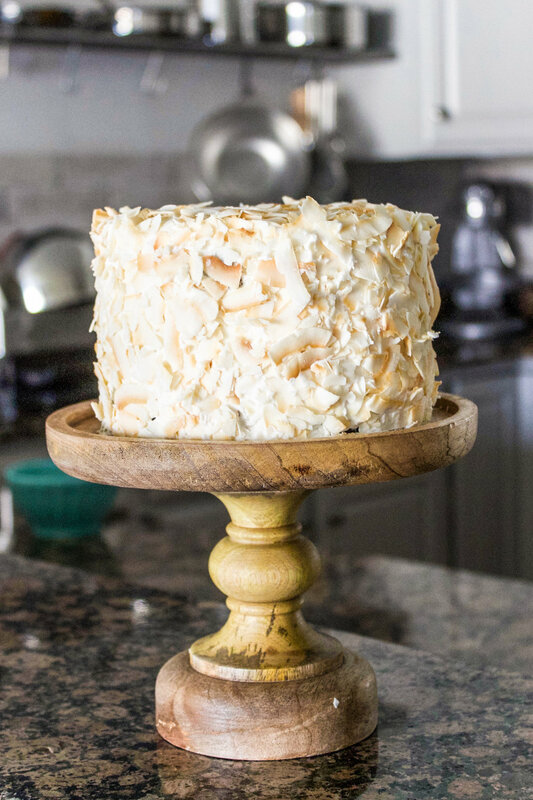 Frost the cake and then cover the thing with coconut flakes. Top with candles if you're celebrating a birthday, and sing as loud as you can. Enjoy a fat slice with lots of good company. Happy happy Sunday, and have a great start to your week!